Missiles continue to rain down on Israel at this hour, and even the New York Times is admitting that the region is on the “brink of war”. On Monday, more than 300 rockets and mortar shells were fired from Gaza into Israel, and the Israeli military struck back extremely hard in response. Many observers had been hoping that the barrage coming out of Gaza would slow down on Tuesday, but so far that has not happened. The Times of Israel is reporting that missile alarms were shrieking all over southern Israel as dawn broke on Tuesday, and at least 70 rockets and mortar shells have been fired at Jewish cities since midnight. If the barrage does not stop, there will be war. As you will see below, large numbers of IDF troops and tanks have been spotted heading to the Gaza border. Fortunately, many of the rockets that have been fired at Israel have been intercepted by the Iron Dome missile defense system, but quite a few were able to get through. 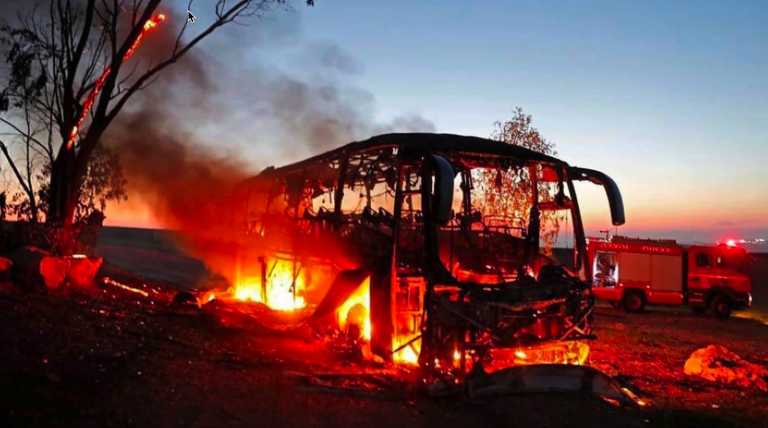 With air-raid sirens wailing from the Mediterranean to the Dead Sea, and after a Palestinian anti-tank missile blew up an Israeli bus, seriously wounding a 19-year-old soldier, Israel retaliated with airstrikes and tank fire that grew steadily more destructive as the night wore on. Israel hit scores of military posts and weapons caches across Gaza, but also leveled a Hamas television station, radio station and office building, and the group’s military intelligence headquarters. It was the heaviest fighting between Israel and Gaza since their war in 2014. Many in the Islamic world are attempting to claim that Israel’s response was too harsh. Hours after an Israeli bus was struck by Hamas mortar fire from Gaza, resulting in injuries, which was accompanied by a sustained exchange of fire involving 100 rockets and Iron Dome defense response fire, Israeli jets have bombed the studios of Hamas’s television station in the Gaza Strip. According to Reuters the huge airstrike was preceded by “warning” phone calls non-exploding missile “taps” from the Israeli military for locals to evacuate the the building housing Al-Aqsa Television — the official broadcast station operated by Hamas. News of casualties was not immediately forthcoming, but the strike produced a massive fireball captured through local video and eyewitness reports. A state of war essentially already exists between Israel and Hamas, but it looks like there is a very real possibility that Israel could shortly conduct a full scale ground invasion of Gaza. On Monday evening, large numbers of tanks and other military vehicles were seen being moved down to the Gaza border on the backs of large trucks. Earlier in the day, before the barrages began, the army also ordered extra infantry battalions to the region. Hamas could prevent this invasion by ending the barrage, but it doesn’t look like that is going to happen. If Israel invades Gaza, it will be an extremely bloody conflict. And it could also spark a much wider regional crisis. Meanwhile, Israel reportedly sent a “final warning” to the Lebanese government that it will destroy Hezbollah factories that it says will be used to upgrade its missiles unless action is taken to shut them down. The Israeli government claims Iran recently supplied Hezbollah with precision-guidance munitions that will enable the terrorist group’s missiles to strike within 10 meters (33 feet) of their intended target. The missiles are being upgraded in small factories, similar to those being used by Hamas and Islamic Jihad in Gaza, that are scattered throughout Lebanon, but are difficult to target with air strikes or missiles because of their proximity to civilians. If Israel bombs those factories, Hezbollah will literally unleash hell. Various estimates put Hezbollah’s overall rocket and missile stockpiles at between 120,000 to 140,000—up from roughly 10,000 in the last conflict in 2006. If things go badly, Israel could very easily find itself fighting Hamas in the south and Hezbollah in the north simultaneously. And needless to say, if that happens we are just a hop, skip and jump away from World War 3. Because of the times that we live in, it is imperative that we watch Israel very closely. It is one of the smallest nations on the entire planet, but once again it is at the center of attention. If a major conflict erupts, the entire world will be shocked by the bloodshed, and it could set in motion a series of events that will have very serious implications for all of us.